Lynn Salsi, MFA is an author, playwright, storyteller, media producer, and scholar. She has published multiple books, plays, poetry, articles and essays. 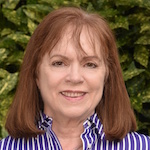 Her writing awards include an American Library Association Notable Book Award, Jackqueline Longhard World Understanding Lecturer, Stars and Flags gold medal, and a Pulitzer Prize nomination for The Life and Times of Ray Hicks, Keeper of the Jack Tales. Salsi’s scholarly concentrations include: Use of Inherited Narrative in Writing Fiction and Cultural Depictions in Literature in the Age of Digital Modalities.